Hot Shot Progressive game is loading.. 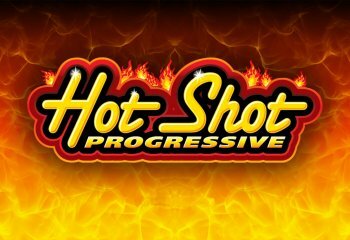 The Hot Shot Progressive slot is the ultimate version of 5 legendary editions of Hot Shot games from bally. Play Hot Shot Progressive with 5 different Jackpots. Any 3 or more of BLAZING 7S, DIAMOND LINE, DOUBLE JACKPOT, TRIPLE JACKPOT, or SEVEN TIMES PAY initiates the Game-in-Game scatter bonus. The Game-in-Game scatter bonus initiates 1 spin from each 3 reel game displayed. 4 Of a kind wins only occur on DIAMOND PLAYLINE. 1x DOUBLE JACKPOT in a line pays 2x winning combinations. 2x DOUBLE JACKPOT in a line pays 4x winning combinations. DOUBLE JACKPOT is wild for all symbols. 1x TRIPLE JACKPOT in a line pays 3x winning combinations. 2x TRIPLE JACKPOT in a line pays 9x winning combinations. TRIPLE JACKPOT is wild for all symbols.